When you are prospecting which real estate investment trust (REIT) to purchase, you will choose one REIT with a higher, more acceptable dividend yield isn’t it? There are readers that tell me, they wouldn’t purchase this REIT because the Price to Book ratio is high. That is usually the metric to say asset based investments like REITs are expensive. Today, I am going to show you that high dividend yielding REITs may not always trumped those low dividend yielding REITs. There are benefits when price to book is high for a REIT. We also answers the question How does a typical REIT grows over time? And if you want better prospect and sustainable growth, you have to look at REITs in a different way. If you are looking to buy a trust with a manager, managing a group of properties, you have many choices in Singapore. 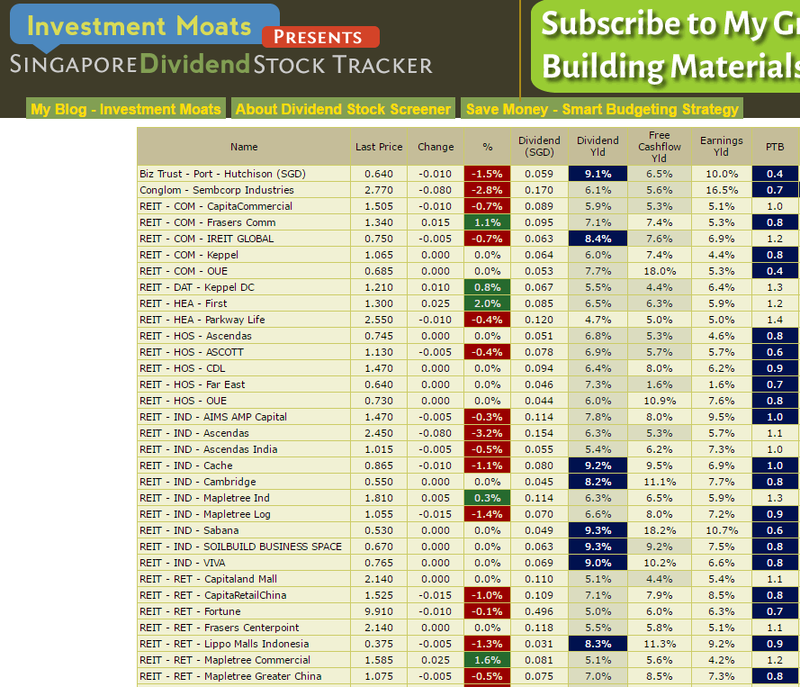 There are currently 37-38 REITs listed on the SGX. On my Dividend Stock Tracker, you can find majority of them. You will tend to zoom in to the higher yielding ones, such as Cache Logistics Trust (Dividend Yield 9.2%), Soilbuild Business Space (Dividend Yield 9.3%) or IREIT Global (Dividend Yield 8.4%). 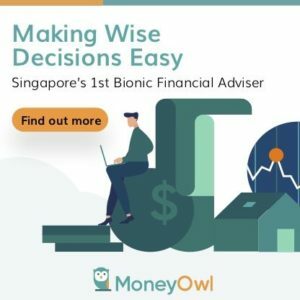 You will tend to shun the lower dividend yielding REITs, such as Parkway Life REIT (Dividend Yield 4.7%), Keppel DC REIT (Dividend yield 5.5%), Fortune REIT (Dividend Yield 5%). If you look at these three low yielding REIT’s Price to Book Ratio (PTB), they are respectively 1.4 times book value, 1.3 times book value, 0.7 times book value. If higher dividend yield and lower price to book ratio are the basic valuation techniques of what is expensive and what is cheap, isn’t the straight forward decision to purchase the high yielding REIT? The first thing that you need to be aware of is that dividend yield and price to book are just 2 areas to evaluate. Due to the nature and profile of what is purchased in the REIT, there is a reason some REITs have a higher dividend yield compared to others. Due to the differences in the demand and land lease of property left, Retail REITs tend to have lower dividend yield then Commercial and then Industrial REITs. What makes up your return when you invest in a REIT is not just the dividends but also the capital growth. Suppose you are an investor on the sidelines looking at a particular REIT. The dividend yield explains itself. It is derived from current dividend cash flow distribution of the REIT divided by current unit price of the REIT. Compounded Capital Growth can be viewed as the growth of the REIT’s dividend but also the share price. 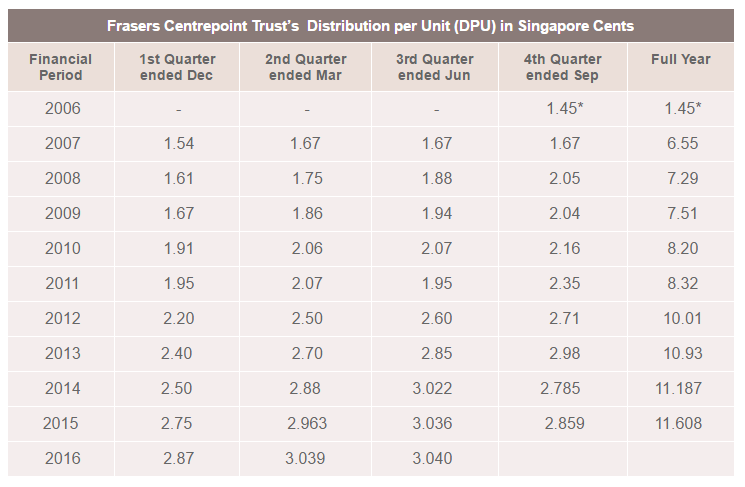 In a theoretical way, suppose current dividend yield of Capitaland Mall Trust (Dividend yield 5.1%) is 5.1%. For the next year, if you look at Capitaland Mall again, its dividend per unit should go up from growth, and the dividend yield should be 5%. For the dividend to stay around 5%, it means the share price has to go up. For the next year as well. The opposite is also true, when dividend per share has negative growth. To compensate shareholders, the dividend yield will remain at 5%, but the dividends per unit is smaller. In this case, the share price have to go down. REITs, unlike normal stocks listed on the market are unique in that they are able to pay out their dividend cash flow distributions from their free cash flow. They are able to pay out higher than net income as they do not have to pay taxes. This is provided that they pay out at least 90% of their cash flow as dividends. This is not cast iron and subject to change. As the REITs payout almost all their cash flow as dividends, they retained very little cash flow to carry out initiatives to grow, such as the purchase of new property assets. To grow, REITs need to Tap the capital markets. You need to understand the balance sheet of a typical REIT. In other words, the managers of the REIT can fund new purchase or other capital requirements either by adding to the equity or liabilities. #6 is usually the go to option first. This is when cost of debt is cheaper. However, a REIT cannot be over leveraged and usually when they hit 42% debt to asset, they would have to look for other sources of financing, or wait for the asset value to go up so that the debt to asset ratio will go down. When the debt to asset goes down, the trust can then fund more acquisitions by debts. Managers will then turned to #1, #2 and #3. Placements (#2) are more preferred because existing shareholders are generally not receptive to the idea of having to cough out money from their pocket in Rights Issues to fund the acquisitions. Placements tend to be done when the share price is performing well. When share price is performing well, the cost of equity is cheaper. The manager might also do a non-renounceable rights issue (#3) when the share price is performing well and the acquisition is accretive. When share price is performing well, the cost of equity is cheaper. If the share price is not doing well, but due to circumstances, or that the manager wants to force an acquisition, they will call you to put in more money in a renounceable rights issue (#1). This is usually to offer you to put in more equity at more heavily discounted share price (compared to non-renounceable). When they need to discount so much, the cost of equity is comparatively more expensive. This is usually done when the manager thinks it will not be well received. When both debts and traditional equities are difficult, or that the acquisition is big, then the manager might turned to CPPU, perpetual securities, convertible bonds, perpetual bonds. These are hybrid between equities and debt, and some do not add on risk to the REIT’s balance sheet (but reduces cash flow to pay the shareholders), while convertible bonds or CPPU can be lower in interest expense, but subject you the shareholder to future dilution. In some complicated situations, or when the deals are too big, a combination of all the previous 3 can be carried out. Shrewd Managers, who are well connected to good resources, will be in a better position to structure deals to acquire assets. However, during bad times, resources are tight because most lenders (both finance companies and shareholders) are more apprehensive to provide capital. Then acquisitions will be challenging. When a REIT like IREIT Global which, have a dividend yield of 9% and a debt to asset of 42%, they do not have much debt headroom to finance a new acquisition when the debt to asset is so close to 45%. To make it worse, if the asset value plunge they would need to remedy that their debt to asset shooting up. For a new acquisition to be accretive to you, if you are an existing shareholder, the new property assets net property income yield now, or somewhere in the future have to be greater than the current dividend yield enjoyed by you the existing shareholder, before this proposed acquisition. In the case of IREIT Global, when they cannot tap by debt, they can go the route of 50% debt, 50% rights issue or placement or a combination of that with preference issues. If not, IREIT global will have to fund the acquisition by 100% rights issue. When your current dividend yield is 9%, the trust manager need to find a property asset that yields greater than 9%. That is a high hurdle. It is certainly easier if it is the case of Parkway Life REIT, whose dividend yield is 4.7%. Parkway Life could have an easier time finding an accretive 15 year lease nursing facility that have an net property income yield of 6%. The difference between IREIT Global and Parkway Life, other than one is a European Centric Commercial REIT and the other a Singapore and Japan Healthcare REIT, is that the market did not recognize the attractiveness of the trust and compress its yield, while the other did. When Frasers Centrepoint Trust (FCT) IPO in Sep 2006, the share price was $1.03. 10 years later today it is $2.14. The share price capital growth is 7.58% per year. If we talk about total return, FCT have rewarded shareholders well. If you have held it during IPO where they projected a dividend yield of 5.68%. 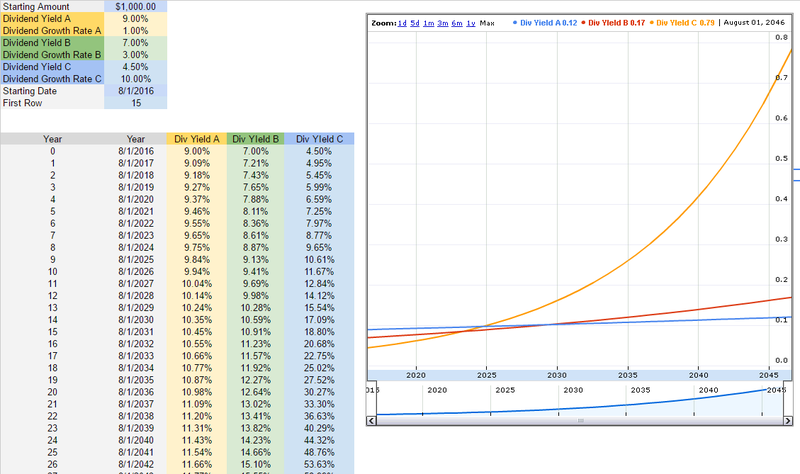 Your dividend based on cost today is 11.3% yield. If you are a new shareholder to FCT, the prevailing dividend yield is 5.5%. FCT’s share price have compressed. This has benefited the trust manager, but also the shareholders in that there was not a single rights issue carried out. Much of the financing of acquisitions was done by way of placements and debt. It certainly helps that institutional investors find the projects attractive. How do we explain this yield compression and acquisition growth in numbers? Perhaps I can show you by way of an example. Over 3 years, this REIT will acquire three properties. It decides to propose the purchase of a property for $50 mil by way of placing out shares to new institution investors. This new property comes with a net property income yield of 6%, which is accretive over the current dividend yield you, the existing shareholder enjoy of 5%. In the second year, the share price of the REIT rose by 10%. No more is the share price $0.55 but now it is $0.605. As the share price rose, the prevalent dividend yield is now 4.84% instead of 5.1% previously. The trust manager decides to propose a new acquisition, this time its bigger at $60 mil. Again, they decide to do a placement and put out shares to new shareholders at a 5% discount over last traded price of $0.575. This new property comes with a net property income yield of 5%, which is slightly accretive over the current dividend yield you, the existing shareholder enjoy of 4.84%. Notice that as the dividend yield is compressed from 5.1% to 4.84%, the hurdle for new acquisition purchase is reduced and more accretive properties come into the picture. In the third year, share price of the REIT goes up another 10% due to its good quality assets, and growing equity base. The trust manager decides to gobble up something bigger at $140 mil. As the debt to asset have come down, the trust manager have the option of funding the property asset with $80 mil placement and $60 mil from debt. The placement is done at a 5% discount. This new property comes with a net property income yield of 4.5%, which is accretive over the current dividend yield you, the existing shareholder enjoy of 4.38%. Notice that as the dividend yield is compressed from 4.83% to 4.38%, the hurdle for new acquisition purchase is reduced and more accretive properties come into the picture. The dividend on cost for you, the shareholder invested at the start of year 1, grew from 5% (0.0275/0.55) to 5.54% (0.0297/0.55) over three years, purely by acquisitions. While there are dilution, what matters is that your dividend per unit goes up during this period. It doesn’t take a genius to figure out, that if you pick a good REIT that is well supported in the market, you stand to make good benefits. If you are not an existing shareholder, but an investor on the sidelines evaluating this REIT, you will be hoping the management keeps this mandate going. It means for good REITs, if you sit in them long enough, you will see the benefit compound. Does that mean high yielding REITs are inferior? Not necessary. Some of these REITs are just neglected and the market have failed to accord them with the right valuations. One good example is First REIT (Dividend yield 6.5%). First REIT is a healthcare REIT with majority of the assets in Indonesia. For a long time, its share price hovered around $0.60 to $0.80. The prevailing dividend yield is 8%. While 8% seems like a high hurdle to make acquisition, in Indonesia where the risk free rate is much higher, First REIT can still find hospital then that provide a net property income yield of 9%. They did a rights issue then and after that, the market began to recognize their long 10 years average lease and the share price rose to a high of $1.40 but eventually settled at current $1.30. At a current prevailing dividend yield of 6.5%, it is much conducive for them to find accretive targets particularly from their parents. You would hope that your high yielding REIT fall into this picture. Another important factor, that needs to be said is that to fund large acquisitions or to consistently fund acquisitions, will require the trust manager to have various funding sources. The smaller REIT managers lose out when it comes to this aspect. Trust managers with sponsor backing tends to do this better. Some complex deals require not just a placement, or debt, but a combination of placement, rights issue, debt and preference issues. The latest Ascendas REIT (Dividend Yield 6.3%) purchase of Australian assets by way of placement, preferential offering to existing shareholders, perpetual securities and debt. I highly doubt all REITs can do something like this easily. While the majority of the article talks about the virtues of a low yielding REIT, we do require to wait some time before the dividend yield of the low yielder to top that of a high yielder. In this illustration above, we simulate three different REITs with the same value of $1000. The first REIT is a high yielding REIT with a dividend yield of 9% but its growth in dividend per share is 1%. The second REIT is a balance REIT that yields 7% and its growth in dividend per share is 3%. The last REIT is one where its dividend yield is a low 4.5% but its growth rate is 10%. The second REIT will take 13 years for the dividend to overtake the first REIT. The third REIT will take 7 years. However the crux is that it will take some time and it is whether you would want to wait. One thing of note is that the capital growth of the dividends and the share price might be very different. What this means is that while dividend capital growth might be 10%, the share price growth might be a much faster pace, making the low yielder more attractive. Does this mean that we can buy an Expensive, high price to book, low yielding REIT? This article give you an illustration how a REIT grows, why a lower yielding REIT can be attractive. However, total return is just one selection criteria. While an expensive REIT can grow, the music have to stop at certain point. In summary, what is expensive can remain expensive for longer than you anticipate, but the tide or economy will turn such that this growth will have to pause or in the worse case reverse. You have to respect value always. How the Manager tackles #1 and #2 to mitigate the impact during down cycles is also a test of quality. 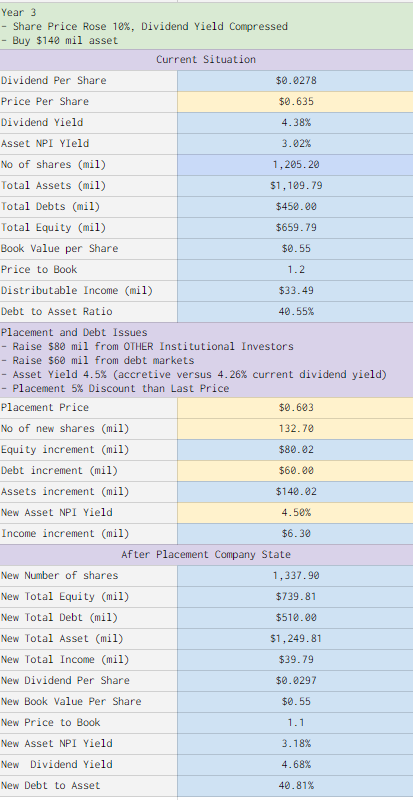 Accretive Acquisitions – Why New Asset NPI Yield versus Dividend Yield? I need to elaborate a bit here in short. In general, we evaluate whether an asset should be acquired or not based on its return versus the cost of capital. Cost of Capital could be the various financing methods. If your cost of capital makes up majority of debts, your cost of capital could be between 2%-4%. If it is preference shares it could be 4.5-5.5%. For rights issues or placements, the cost of capital, is the opportunity cost of making this acquisitions, or the cost the company, say First REIT need to pay its equity holders. In this case it is the dividend yield of 6.5%. I hope you have a better understanding of how a REIT could grow via acquisitions. When I started I always thought that a REIT’s purpose is to distribute the dividend cash flow. It looks like I am not the only one. Superficially, mortgage trusts seem to resemble mutual funds designed to provide high current yields. But the analogy is misleading. The true attraction of mortgage trusts lies in their ability to generate capital gains for their shareholders by selling additional shares at a premium over book value. If a trust with a book value of $10 and a 12% return on equity doubles its equity by selling additional shares at $20, the book value jumps to $13.33 and per share earnings go from $1.20 to $1.60. Investors are willing to pay a premium because of the high yield and the expectation of per-share earnings growth. The higher the premium, the easier it is for the trust to fulfill this expectation. The process is a self-reinforcing one. Once it gets under way, the trust can show a steady growth in per-share earnings despite the fact that it distributes practically all its earnings as dividends. Investors who participate in the process early enough can enjoy the compound benefits of a high return on equity, a rising book value, and a rising premium over book value. true, but it also might be market hasn’t realize it like first reit. Is it possible to issue placement shares at a premium to book value? i dont think instituitional investors will bite. Is there any Reit that manages to place out higher than book value? hi sgdividends, thanks for pointing out my mistake there. Yes I think the institutional investors will not bite. I overlooked that part. But with regards to placing out above book value that should be a common thing or am i wrong there as well. 2015 they did a private placement at $0.795 per unit and justifying that by comparing with the VWAP for a certain period. I looked at the book value then it was $0.80, so its still a discount, however a small one. Actually, yield accretive could also be issuing bonds at a low coupon. For example, soilbuild manage to issue a recent bond 2016 at 3.60% coupon. If they can buy and rent an industrial building at higher than 3.60% coupon, it would be yield accretive, even if the rental yield of the property is lower than the current 9% dividend yield. I digress, i know you focused on placement and rights in the article. Was thinking if yield accretive should be compared between NPI yield and dividend yield . Hi SgDividends, no issue for digressing. I am happy it generated some thoughts to validate your conviction. If you would like to tell me your conviction in Soilbuild i would love to hear. You are right that the focus is more on when a reit ran out of room for leverage. if soil build issue a debt and it is below the NPI yield, chances are it will definitely be worth it (risks aside). I would think that is the best measurement. Why is accretive measured by NPI versus dividend yield is because you always measure the opportunity costs. if the capital majority is debt then of course is around 3-4%, but if its equity based, its what if the average dividend yield in the market is 6%,or for the shareholders it is what it might have been have they not swollow this asset. The placement price is usually with respect to the market price, unless the price is ridiculously higher than book value. Can look at Mapletree Commercial recent placement as example. Excellent Article as usual. You let a lot of secrets out to my dismay ! One thing i like to point out is yield accretive is not straight forward due to contractual, tax, fees etc I would prefer at the end of the day, the DPU in cents to fact check. Personally i do not like rights issue as i am unclear underlying things i need to know. If the deal is good and reit strong, they should be able to get private placement at premium or same, bond or preference shares. Any deal that need to issue discounts mean something not right is happening. That may not be true but i will start with this assumption. Hey Cory, I hope i did not do something drastic! Using DPU to factcheck is right, and you know this calculator that i use needs some intelligence in that the new asset NPI yield may need to factor in some interest expense or taxes. I just did some figures with FLT, and realize that they have a 10% tax that other reits do not have. cory i amended the figures for the placement at premium to discount. SGdvidiends raise a good point, and i did some check on FCT placements and they are at a discount. The same case is also for MCT. It might not be not good, just that psychologically they need some idea that they are getting something cheaper. 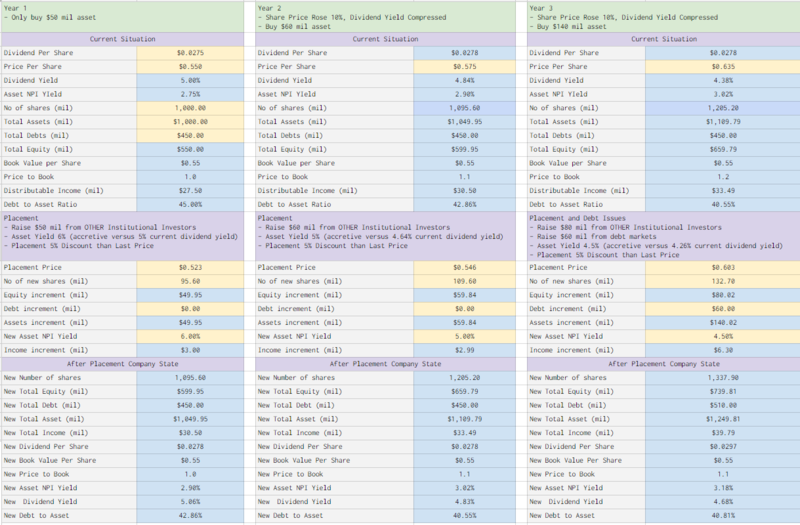 I looked at the price book ratio，gearing， Dividend yield .quite common . Oil and gas is about 23% of gross rental income ….worst case write off all o and g tenants, the Dividend yield is still 6.55%.. Thanks of your detail analysis and I really admire your effort and thorough thought. I vested in many reits & business trusts and the only thing I learned is that the asset manager and sponsor are the key to the success of the business growth. Some reits just sucking fund while some really create value. For First reit, the share price dropped seems due to rumor that it could be re-list at Indonesia. Could this happened and if so what is the consequence? Is there a website that calculates the total return of reits? (capital gains + dividend) per year? Thanks. Hi K, SGXCafe computes the XIRR which is the internal rate of return over time. Not total return but would be very useful in what return rates you get as well. I cannot see XIRR at the SGXCafe website? you need to create an account and form your own custom portfolio to do that. there are some portfolio construction involved. a well thought article, good read. btw, how to save/store such articles online for future reference? Hi Bruce, download this cloud app call Pocket. They have extensions on Safari, Chrome and Firefox and android that allows you to save articles and read them offline. hi kumar, hope it helps. There are many under my REITs Training Center as well under Resources. Hi Kyith! I’m from Malaysia. Your articles are very informative. Now I have a clearer view on how to pick a good mREIT. Thank you so much for your effort. HI Lee, thanks a lot. To be fair I heard from my friend Rusmin of Fifth person who does a fair bit of Malaysian REIT that you guys have less financial engineering which is good. Great article, I have learned a lot reading this. Have always wonder how REIT can grow when they distribute almost 100% of their income. Can I ask will there be any difference if REIT do placement issue new shares at premium or discount? Also, do you think is a better comparison using REIT overall property yield % to compare against the new acquisition? If not, how do you determine the Dividend Yield for comparison when the share price is constantly moving? Hi Jonathan you asked some tough questions and I will try to provide my perspective. >If not, how do you determine the Dividend Yield for comparison when the share price is constantly moving? This is difficult, even in a period of rights issue, when the share price is trading. My answer to this is: Look for attractiveness of good valuation going forward. This means that you are looking at a good total return for the price that you pay. For example. If you have a stock that has a dividend yield of 5% and would grow at 5% for the next 3 years conservatively, that is 10%. pretty neat. Contrast this to a stock that is having a 8% dividend yield but the challenge will make the growth to be -4% for the next 3 years. That is 4%. we are trying to buy at a price that shows value, and that is you are paying a lesser price for the intrinsic value. And these REITs are valued based on their cash flow in the future. So you need to assess the fundamentals of their cash flows going forwards, with some qualitative analysis and the management in the past. Conservatively if you can get something that yields well at 7% and growth rate is 0%, versus a 10 year government bond rate of 2.7%, i think that is pretty good. if the growth rate is -2%, then that may not be attractive. You can buy a 7% + 0% but conservatively hope that it grows at 2%, so that is your margin of safety. PRices and earnings will be volatile. You have to routinely evaluate. If the property cycle is not right, you might wish to rebalance. > Can I ask will there be any difference if REIT do placement issue new shares at premium or discount? 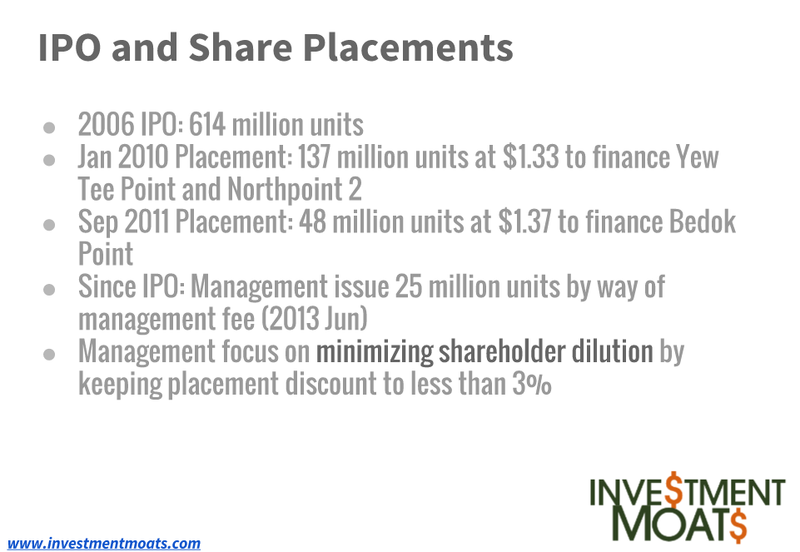 Placements usually need a little 4-7% discount to the current share price, just to attract the institutional investors. it is seldom at a premium. The REIT manager sometimes manipulate the market so that the price goes up, or is stable for the period. I hope i am answering to the right question on what is premium or discount. > Also, do you think is a better comparison using REIT overall property yield % to compare against the new acquisition? When you compare the dividend yield to the NPI yield of the new property, you are comparing the cost of equity currently faced by you a stakeholder, versus the new property. It is to measure whether it adds value to the portfolio. However, if we are asking whether the new property is value, versus the existing portfolio of property, then yes you can do a npi yield comparison. what you derive is the answer to is this property more attractively value yield wise versus my current portfolio. note that for current portfolio you need to use the market cap rate, not the yield on cost. of course this is one of the permutations. quality of tenant and structure can determine whether a lower npi yield might be worth more. That is a very detailed reply! Thank you so much spending time to explain. Very helpful for my learning! In your article “http://investmentmoats.com/money-management/reit/how-does-reit-grow-over-time/”, when you talk about “Return > Cost of Capital” under Accretive Acquisitions – Why New Asset NPI Yield versus Dividend Yield?, what is the “definition” of the return? is it including the rental income, and capital growth? And, when pepople talk about new acqusitons has to be accretive, they are talking about the “property income yield”, NOT the DPU? Hi Anthony, the return here is referring to the consistent yield that you will get for this acquisition versus the cost of capital. In stocks the owner have 2 sources of capital: debt or raise more equity. the cost of equity is the dividend yield because, if you are an existing shareholder, and the current dividend yield is 7%, and this property will not add to your dividend yield, then why should you approve them to purchase this asset? if the dividend yield after this is less than 7%, why would you approve this transaction and see your dividend get reduced by this acquisition. Hence a lot of times, the cost of capital for a REIT is either the interest expense of the debt or the cost the manager needs to pay existing shareholders (in this case the dividend income). There might be a bit of confusion here as well, because the manager can finance the property by a mixture of debt and equity. so that is 2 different cost of capital. at the end of the day, the resultant dividend yield for an EXISTING OWNER in the REIT should be higher, for it to be deemed accretive. there are rights issue where the dividend per unit ends up lower, but because the existing owner subscribes to discounted rights shares, they eventually end up with a higher dividend yield.